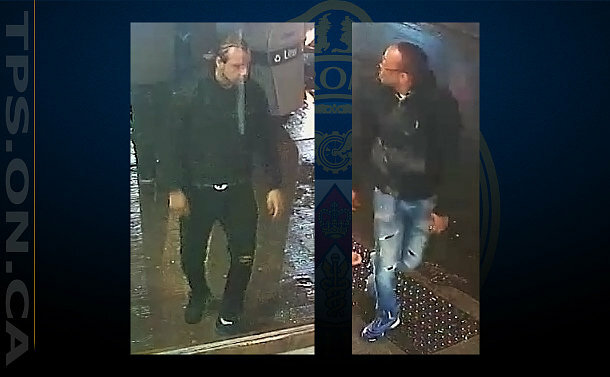 Police are seeking the public’s help identifying a vehicle and two suspects in connection with an attack on a city resident early on New Year’s Day. On January 1 at around 12.30 a.m., David Shellnutt and a woman were walking west on the south side of Queen St. W. near Bathurst St. when the occupants of a Blue Dodge Charger, that was stopped in traffic, directed some remarks at Shellnutt’s companion. “There was an exchange of words between the two groups in the Charger and its occupants continued travelling east on Queen St. in heavy traffic before coming to a stop at a traffic light at Queen & Bathurst,” said Det. Scott Allan at a press conference at police headquarters on January 17. Video surveillance shows Shellnutt taking a bag of garbage from the sidewalk and throwing it at the vehicle, striking it. The two male passengers pursued Shellnutt and in the ensuing altercation, one of the men delivered a punch to the side of his face, causing him to fall backward and strike his head on the concrete sidewalk. As the victim lay unconscious on the ground, the second man punched him on the same side of his face, causing his head to strike the sidewalk a second time. The two men then drove off south on Bathurst St. The victim was rushed to hospital and underwent surgery to repair an injury to his brain. His condition is slowly improving. 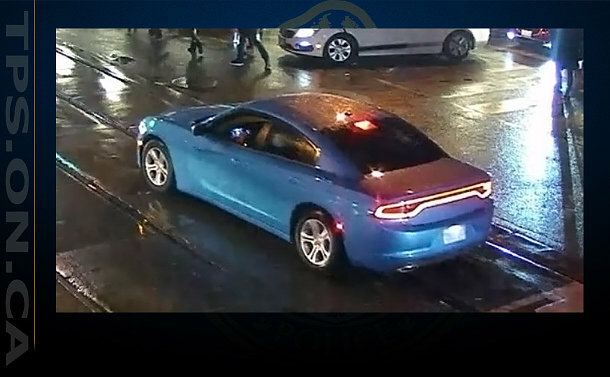 Allan said the vehicle is believed to be a B5 blue 2019 Dodge Charger SXT with an unknown license plate and possibly a rental vehicle. The first suspect is described as having a light complexion, 25-35 years, 6’1”, medium build with dark brown hair worn in cornrows and a pencil beard. He was wearing a grey coat over a black hooded top, black pant jeans with tears on the front of the legs, white socks and black running shoes with blue soles. The second suspect is described as having a medium complexion, 25-35 years, 5’9”, medium build with short dark brown receding hair, a goatee and moustache. He was wearing eyeglasses. He was wearing a black waist-length coat over a black hooded top, medium blue jeans with tears on the front of the legs and light navy blue running shoes with white soles. Police determined that the vehicle was in the King St. W and Peter St. area about 14 minutes after the attack. “Anyone with dash cameras or that had other involvement with this group or knows who they are, is asked to contact us,” said Allan. Anyone with information is asked to call 416-808-1400, Crime Stoppers anonymously at 416-222-TIPS (8477), online at222tips.com, online on our Facebook Leave a Tip page, or text TOR and your message to CRIMES (274637).